The project: A lower-level family room in a Chanhassen house. What worked: Ample space, back-yard access and two large built-in closets. What didn't: Dark caramel walls, low ceilings and a poor layout. Aesthetically, this cozy space was great for lounging and watching TV, but it felt dark and cramped. "Visually, you never got past the heavy furniture arrangement at the entry point of the room," said Lori Matzke of Centerstagehome.com. 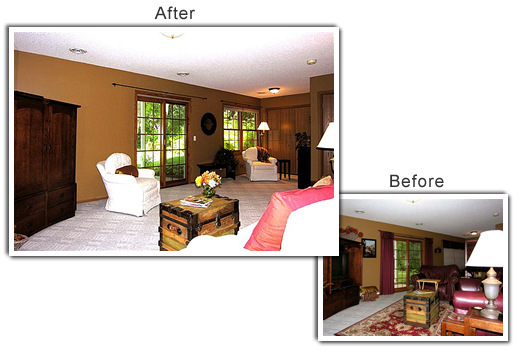 Here's what Matzke did to create visually appealing space to match the square footage. She removed excess accessories, including an area rug that was distracting and added to the heavy feeling. She also removed a folding screen that had been used to separate the front of the room from the back to open up the traffic flow between areas and give buyers a better feel for the overall space. Eliminating the heavy drapes lets more light into the room and draws less negative attention to the caramel walls and low ceilings. Drapery rods, stylish and in good condition, were left in place for the new owners and to avoid the need to touch up any holes with leftover paint, because touch-ups can be much more visible on darker surfaces than light. Opening the pleated blinds on the back window allows more natural light and draws attention to the back of the room and the outside view. It also helps accentuate the windows as a positive feature. Furnishings were arranged to create a more open traffic flow and to let buyers immediately see the space when they enter the room. Replacing the dark leather sofa and chair with a lighter set from the upstairs living room makes the space feel bigger and creates a more flexible furniture arrangement. Lighter upholstery helps brighten the dark walls and makes the ceilings feel taller by pulling the line of view just below midlevel of the room, leaving a sense of height above the furniture line. To show buyers how to use every inch of the space, Matzke created a small reading area in the far corner of the room by grouping an upholstered chair, a brass floor lamp and a bookcase. The bench, removed from the master bedroom to free up space, makes the room feel even more usable. A dark walnut finish on the bookcase and bench helps create consistency. A $40 round, decorative mirror with a dark finish creates more contrast between the sliding glass doors and window. A pillow and throw on the chairs and pillows on the sofa complement the walls. Neutral, low-contrast accessories help downplay the dark walls. Greenery on top of the bench and a bright autumn arrangement on the coffee table/chest make the space feel more inviting.